It’s jam, but not as you know it. It’s more like soft candied carrot. You can still use it in exactly the same way as jam, though it doesn’t spread as you’d expect. The texture is more like a coarse marmalade. 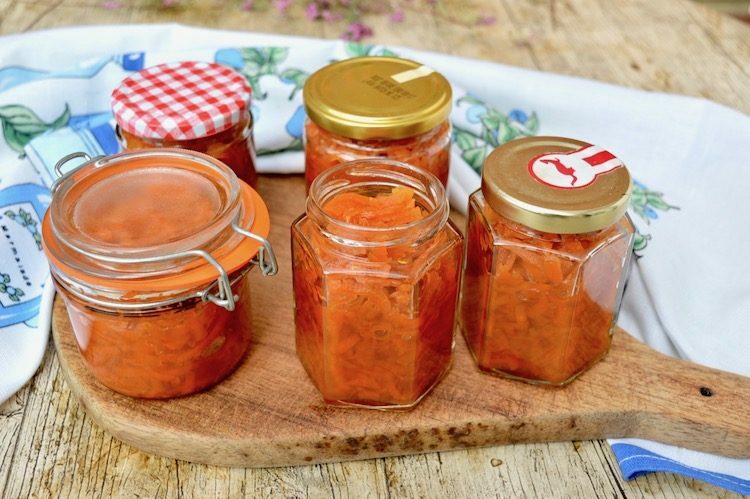 Indeed, carrot marmalade was quite a popular recipe in WW2. It’s this quality that makes Persian carrot jam (moraba-ye havij) so easy to make. Unlike traditional British jam, you don’t need to worry about a setting point. You just keep cooking until most of the liquid has disappeared. The recipe requires citrus to temper any sweetness and add additional flavour. In traditional Persian jam, either limes or oranges are used. I’ve made mine with the zest and juice of two limes and a lemon. Saffron is entirely optional, but if you have some to hand, it does add a depth of colour and some extra floral notes. The flavours of cardamom and rose shine through and transform this rather mundane vegetable into something decidedly exotic. Some sort of alchemy occurs during the cooking process, turning a base of carrot into gold. When it comes to the all important rose flavour, you can use rosewater, rose extract* or my rose syrup. I used the latter, of course. Use whole cardamom pods for this recipe, but just crush them lightly so that the seeds can properly infuse the jam. I leave the seeds in when potting the jam up and just warn everyone in advance, but you could fish them out beforehand if you prefer. The quantity in the recipe below makes five small jars. Mrs Beeton, way back in 1861, wrote a recipe for carrot jam which looks and behaves more like you’d expect a jam to do. But this Persian inspired easy carrot jam appeals to me more. An Arab in Andalusia recorded the first known recipe. It used honey rather than sugar and was flavoured with ginger and cloves. The Shakers brought carrot jam to the US in the 1770s and they used sugar. 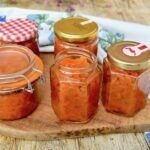 I have a recipe from Mrs M Grieve in A Modern Herbal published in 1931, so it looks like carrot jam was a ‘thing’ in the UK until relatively recently. I’ll forgo Maude’s inclusion of margarine, however. In Iran, carrot jam is often eaten for breakfast along with bread and fresh cheese. 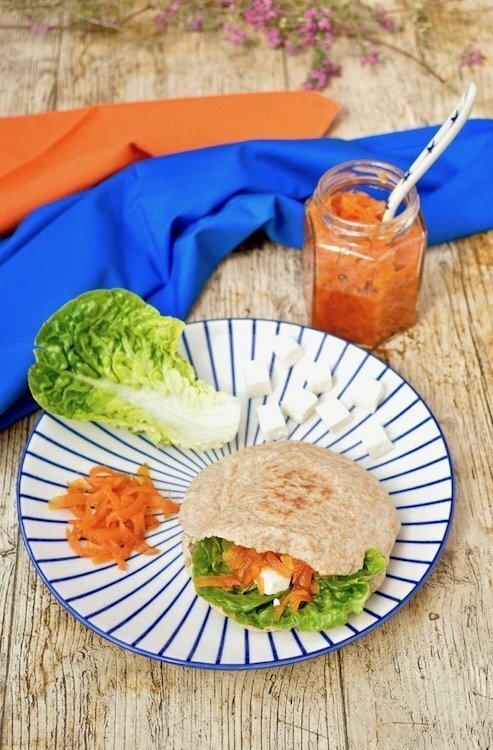 I tried some of my easy carrot jam with salty feta cheese in a warm pitta bread and it was delicious. I’ve been having it for lunch rather than breakfast, but I feel I’ve got a glimpse of the real deal. The only conceivable part of this recipe that might not be easy is grating this number of carrots. Hopefully, you have a food processor* to do this for you. You can find out more about my Von She 1000 on my Granny’s apple pie post. It’s what I use for anything more than one carrot. Grating them all by hand is just one step too far. For more carrot inspiration take a look at my Carrot Recipes Pinterest Board. Whether you’re looking for soups, salads, sides, bakes or something else, you’ll be sure to find something you like. 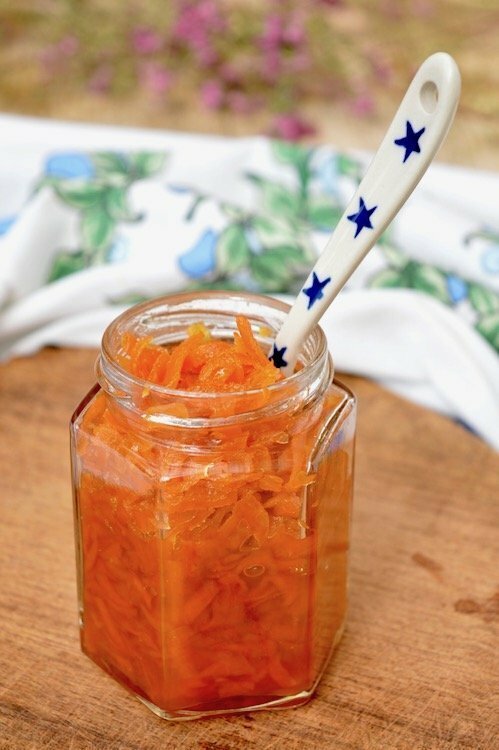 I’m sharing this exotic easy carrot jam recipe with Recipes Made Easy for #CookBlogShare. Thanks for visiting Tin and Thyme. 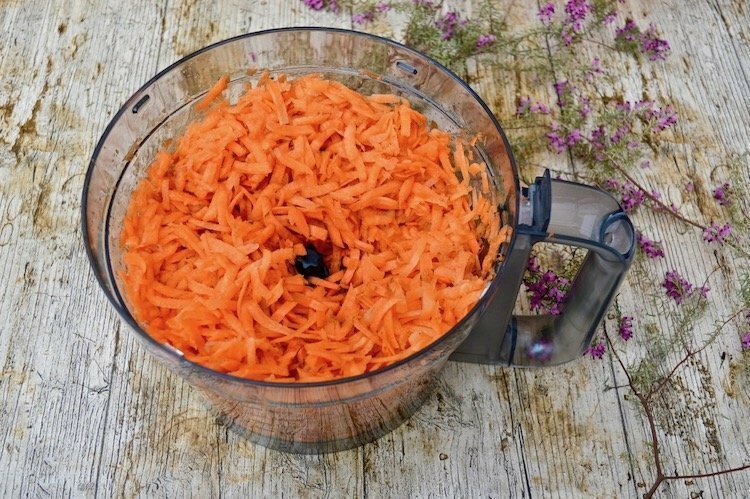 If you make this recipe for easy Persian carrot jam, I’d love to hear about it in the comments below or via social media. Do share photos on your preferred social media site and use the hashtag #tinandthyme, so I can spot them. For more delicious and nutritious recipes, follow me on Twitter, Facebook, Instagram or Pinterest. An easy to make jam with no setting point required. The flavours of cardamom and rose shine through and transform this rather mundane vegetable into something decidedly exotic. Spread on toast or use to accompany salty cheese. Place the carrots, cardamom pods and water in a large pan. A preserving pan is ideal but any large saucepan is fine. Bring to the boil and simmer for 5 minutes with the lid on. Add the sugar and saffron if using and stir until the sugar has dissolved. Finely grate the lime zest and stir in. Bring to the boil again and boil without a lid for 15 to 20 minutes when most of the liquid should have evaporated and the carrots soft. Add the juice of the limes and lemon about ten minutes after adding the sugar. Add the rosewater, rose syrup or rose extract* a couple of minutes before turning off the heat. Spoon into sterilised jars whilst hot and cover. Will keep in the fridge for several weeks. If you leave the seeds in when potting the jam up do warn everyone in advance of eating. Alternatively, you could fish them out beforehand. Please note: calories and other nutritional information are per jar. They're approximate and will depend on jar size and exact ingredients used. This post contains affiliate links which are marked with an *. Buying through a link will not cost you any more, but I will get a small commission. Thanks to my readers for supporting the brands and organisations that help to keep Tin and Thyme blithe and blogging. Candied carrots sound even better than a real jam…wonder if it would be also nice to add some ginger in it? Love that pocket sandwich! I’m not so sure rose and ginger would go together very well, but ginger and cardamom would and I expect that would be very nice too. Oh what a fascinating recipe! I’ve never had carrot jam but I love carrot halwa, a sweet Indian dessert that my mum makes now and then. Lovely! Oh, I remember trying to make carrot halwa when I was a teen. I can no longer remember what I thought about it or even how successful it was, so I reckon I ought to try making some. I love the sound of this Choclette. I have made pumpkin jam before which was amazing and would love to give this one a go. I’ve made pumpkin butter, but not jam. I bet it tastes really good too. Love the sound of your carrot balls Jenny. CT is quite enamoured with the carrot jam – alongside a slab of cheese, naturally. I absolutely love your deliciously exotic touch to something so healthy. Love the look and sound of this, Choclette! What a lovely way to preserve carrots and so unusual. It’s really good Janice. CT is going through it really fast. That carrot jam sounds so tasty! I’d love to try it. I imagine it’s wonderful with cheese and crackers. I’ve only had it with bread and cheese so far, but yes I’m pretty sure it would be good with crackers too. My grandmother was a brilliant cook, but I don’t remember her making jams of any kind. I’d definitely have been up for some carrot jam. It’s really delicious stuff. It’s really good to hear your grandmother used to make it. Oh, you’ve made carrot jam Jacqui. I’m so impressed. Was yours more of a jammy jam? This looks like one of those simple but slightly unusual recipes that I love to try. I also love that you don’t have to look for a setting point – I always start making jam way too late and am up at midnight still waiting for the darn stuff to set! Oh I hear you Anna. I have spent many an impatient hour waiting for jam to set. This isn’t really what I’d call ‘jam’, but it is really delicious. Yay, glad to have enlightened you 😀 Let me know if your little one gives it the thumbs up or down if you do make it. 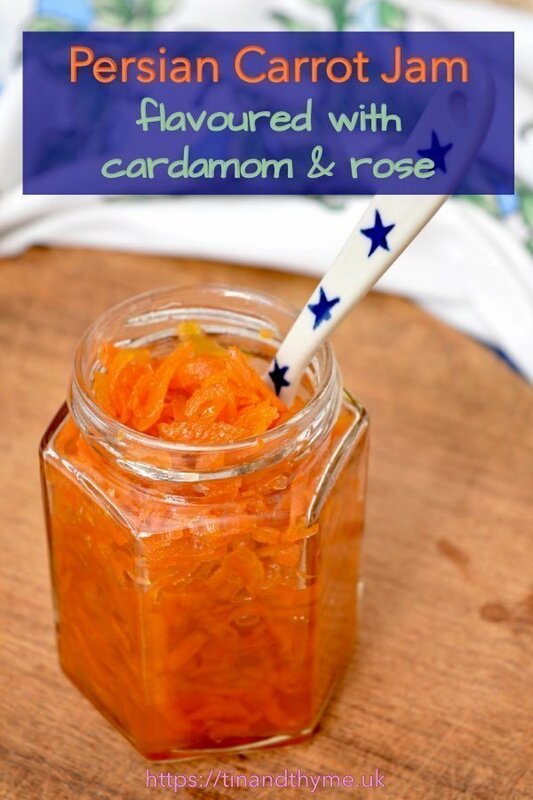 I’ve never heard of carrot jam before – I’d love to try it! This is one of the reasons I love blogging so much. There’s always something new to learn or try. The sound of your carrot jam as well as your lovely lunch of warm pitta with feta and said condiment is making me really hungry. What a great and unusual recipe! I love a good chutney and would love to try your jam with all its wonderful flavours. I thought it might last us quite some time, but it’s so good we’re going through it more rapidly than I’d anticipated.